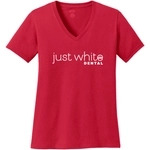 These classic heathered lightweight cotton custom t-shirts are perfect for your next event or promotions! If you are looking for the perfect alternative to your typical cotton t-shirt, then these super soft tultex crew neck tri-blend custom t-shirts have got exactly what you are looking for. If you want to look stylish, feel cool and comfortable all day long and promote your brand on a brand that is recognized, then you want these Under Armour locker custom t-shirts that recipients will love to wear. When you are wearing these Next Level Premium Sueded crew neck custom t-shirts imprinted with your company logo, you will look as great as you feel. The all over sublimated digital camo print and v-neck design of these custom t-shirts will elevate your company apparel to a whole new level.